The concierge at the MGM Grand is either getting fired or some laughs. 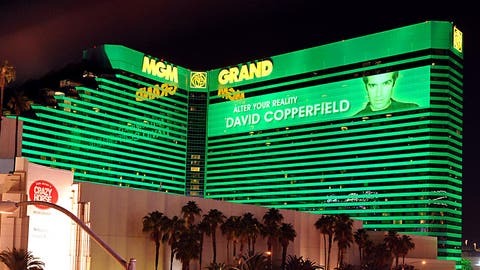 Somebody at the MGM Grand in Las Vegas either has a wicked sense of humor or loves some great drama because as it turns out UFC 168 co-headliners Ronda Rousey and Miesha Tate were given hotel rooms directly next door to one another this week. It’s no secret that Rousey and Tate have a relationship that rivals the Hatfields and the McCoys, so in a bit of fateful irony the two were booked next to each other and could have easily amounted to some fight week action before they ever stepped foot into the Octagon. According to Rousey, who revealed the hotel room situation while speaking to ESPN’s SportsCenter on Thursday, it was her coach from The Ultimate Fighter Edmond Tarverdyan who ran into Tate’s boyfriend and coach Bryan Caraway in the hallway when they discovered the awkward placement of their accommodations. "We discovered last night that they actually put Miesha in the room right next door to me," Rousey revealed. "I didn’t see her but my coach passed her boyfriend on the way out. Thankfully, Mr. Caraway was hiding behind a baby so my coach didn’t do anything. Later that night we heard vacuums going on at 2 am so I’m pretty sure that they ran out and changed rooms." Psychological warfare is the part of any good lead up to a fight so once Rousey discovered her opponent was staying right next door she contemplated how they could use it to their advantage. Needless to say, Rousey wasn’t planning for a stirring rendition of ‘Won’t You Be My Neighbor?’ when she finally spotted Tate. "I was thinking about throwing furniture at the wall but I actually had some stuff to do. So before I actually thought of terrorizing them next door they moved," Rousey said. While the MGM Grand might be filled to the brim this week with fighters, fans and media, it appears they were still able to find Team Tate a new room a little further away from Rousey to avoid any further conflict between the two parties. Rousey and Tate will forget the pleasantries on Saturday when they finally settle their rivalry in the cage in the co-main event at UFC 168.